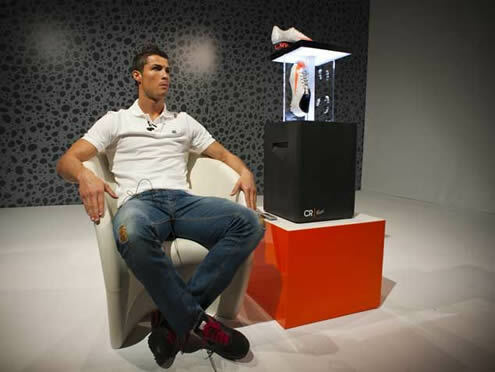 ﻿ Cristiano Ronaldo: "I don't want to play against Spain"
18.11.2011 » Cristiano Ronaldo: "I don't want to play against Spain"
This last Thursday, Cristiano Ronaldo was present at a Nike promotional event called "Explosive Speed", in order to present a few of the brand's new products to the media. Cristiano Ronaldo commented a few topics and confessed he would be happy if Portugal could avoid to be drawn with Spain in EURO 2012 group stage. This Thursday, Cristiano Ronaldo appeared at Nike's promotional event "Explosive Speed", to reveal a few new products from the multinational company, including a new pair of boots. Ronaldo commented the possibility of Portugal being drawn with Spain on EURO 2012 group stage and he confessed that he would prefer to avoid playing against the Spanish Team at such an early stage. CR7 has also stated that being ahead of Barcelona in "La Liga", motivates Real Madrid even more to keep their winning streak. Cristiano Ronaldo: "We're not concerned with what Barcelona does. We don't want to talk about any kind of vengeful feelings and it's important to be aware that there are still several games until we face them on the pitch. I'm confident that if we keep doing things the what we've been doing, we'll end up by winning trophies at the end of the season. Leading "La Liga" and being ahead of Barcelona motivates us even more to keep winning. We're going after all the big trophies this season", said Cristiano Ronaldo to the journalists. Once again, Cristiano Ronaldo was also asked about how hard it has been to put Portugal in EURO 2012 and facing Bosnia in the playoff on that path. Ronaldo: "They were a very difficult opponent. Bosnia has a great team and we didn't have an easy task defeating them. But thankfully, we managed to beat them and we'll be in EURO 2012", noted the Portuguese player. Regarding this summer's EURO 2012, the groups draw will be made in December 2 and Cristiano Ronaldo confessed he doesn't want to play against Spain right on the first stage. Ronaldo: "I don't want to play against Spain. I would prefer to face the other favorites teams in a more advanced stage of the competition", pointed out CR7, before referring that he's not worried about the hostile welcomings he's going to keep facing at Spanish stadiums. Ronaldo: "I don't think about that. I never thought about leaving "La Liga" because of such things. I try not to listen the insults and provocations." Cristiano Ronaldo has already scored 17 goals for Real Madrid this season and when a journalist wondered if he's on the best form of his career, the Portuguese player didn't refute it. Ronaldo: "It's possible that I'm currently on my best form of my career. I want to extend it as further as possible. It's also plausible that this Real Madrid team and squad is the best with who I've played with, but what matters is to win. If we don't win, we can't be seen as the best team. I want to conquer every competition this year and Real Madrid is going after the 3 titles this season." The Portuguese player also predicted a tough game against Valencia, which will take place this Saturday in "Mestalla". Cristiano Ronaldo: "It will be a very difficult game. Last season we managed to score 6 goals there, but this year it will certainly be different. Valencia are now better than they were, and we'll have to put on a great performance to bring the 3 points to the Madrid", noted CR7. Cristiano Ronaldo also anticipates Nuri Sahin future integration on the line-up and praised his teammate: "Nuri Sahin is doing well and I'm sure he'll help this team a lot", remarked Ronaldo.